ALMIRA (1870) On August 26, 1870, while on a whaling cruise in the Arctic, the 310 ton ship Almira was stove in by ice and lost near Point Barrow. She had departed Edgartown, Massachusetts on August 5, 1869 and had accumulated 400 barrels of whale oil, making her loss with cargo $42,000. ARCTIC (1876) On July 7, 1876 the 431 ton whaling bark Arctic out of Honolulu was crushed in the ice 20 miles from shore off Point Franklin (southwest of Point Barrow). The vessel is reported to have had a value of $43,000 and a cargo of whale oil and bone. The crew managed to reach shore and was rescued by the whaling vessel Onward. Comments: A listing of vessels lost in 1876 in U S Revenue Cutter Service records has this vessel lost northeast of Point Barrow on September 12. Many accountings of the Destruction of the Arctic Whaling Fleet of 1876 are available. Source: U S Revenue Cutter Service 1867-1914 Microcopy 641 Roll 1. Additional Information: Tonnage 669 Gross 418 Net, Built 1898, Registration San Francisco, ON 96393, Destination Herschel Island Northwest Territories. Sources: 1. U S Customs Report of Casualty filed at Collection District 28 Port of San Francisco 2. U S Customs Report of Casualty filed at Collection District 31 Port of Nome. 3. The H W McCurdy Marine History of the Pacific Northwest (1966) Pg 357. 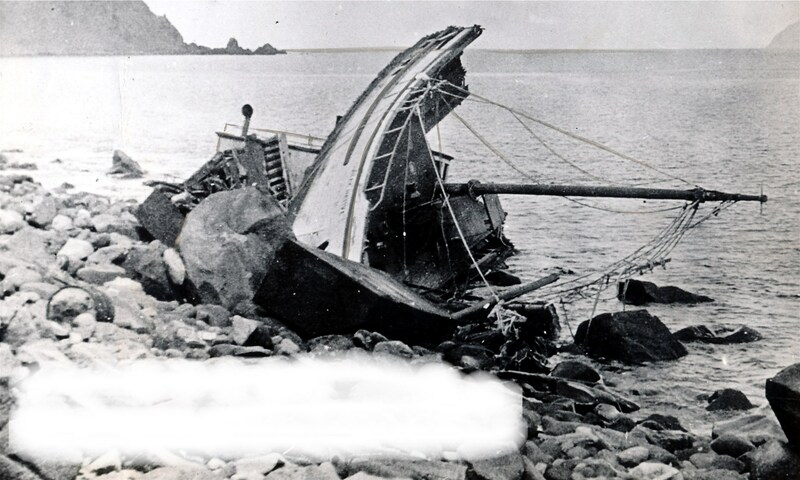 ARNOLD LIEBES (1934) The gas boat Arnold Liebes wrecked at Point Barrow in 1934 and became a total loss. AWASHONKS (1871) The 376 ton wooden bark whaling vessel Awashonks was caught and crushed between two ice floes off Sea Horse Island, near Point Belcher, Alaska, September 12, 1871. She was valued at $58,000. The officers and crew of the Awashonks escaped to other vessels of the whaling fleet. Comments: The loss of whaling vessels during 1871 is well documented in many locations. I have found several newspaper stories about your Father and the halibut schooner Alaska including the newspaper story of his accident in 1923. I will send them via email. I also have the wreck report from 1928 of the schooner Alaska on Kodiak Island which I will send as well. Hope this is helpful. Thanks for your response. I never received anything and would sure appreciate it if you could send the info again. My e-mail address is: donald_e_heitmann @yahoo.com. In advance, thank you for your efforts. As an aside, I got my grandfather’s name on the Fishermen’s Memorial in Ballard, WA. Glad to hear that you have gotten your grandfather’s name on the Memorial. I will send you an email attaching the original article of his demise along with his obituary and the obituary of his wife many years later.